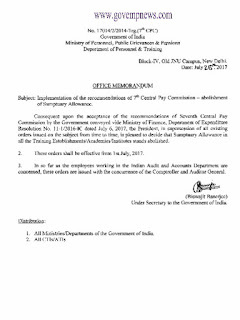 7th CPC Allowances Order: Abolishment of Sumptuary Allowance - DoPT OM ** No. 17014/2/2014-Trg. (7th CPC), Government of India, Ministry of Personnel, Public Grievances & Pensions, Department of Personnel & Training ** Block-IV, Old JNU Campus, New Delhi, Date: July 25th 2017 ** OFFICE MEMORANDUM ** Subject: Implementation of the recommendations of 7th Central Pay Commission - abolishment of Sumptuary Allowance. Block-IV, Old JNU Campus, New Delhi. 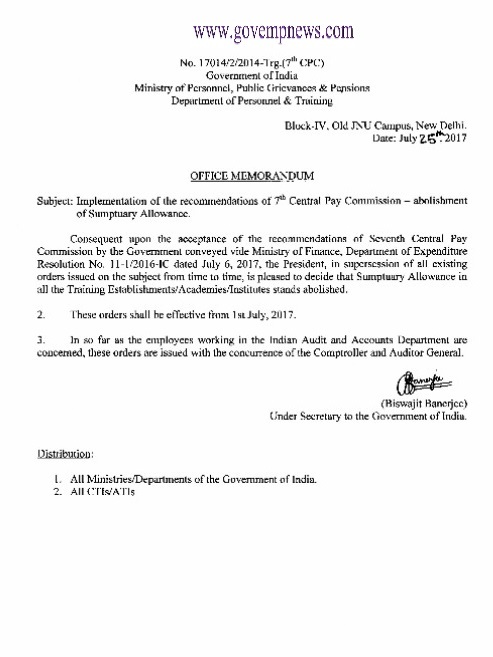 Subject: Implementation of the recommendations of 7th Central Pay Commission - abolishment of Sumptuary Allowance. Consequent upon the acceptance of the recommendations of Seventh Central Pay Commission by the Government conveyed vide Ministry of Finance, Department of Expenditure Resolution No. 11-1/2016-IC dated July 6, 2017, the President, in supersession of all existing orders issued on the subject from time to time, is pleased to decide that Sumptuary Allowance in all the Training Establishments/ Academies/ Institutes stands abolished. 3. In so far as the employees working in the Indian Audit and Accounts Department are concerned, these orders are issued with the concurrence of the Comptroller and Auditor General.